It’s easy to make the texture using this cork, all you have to do is break off chunks and glue them down. Then once the glue is dry have at it with a sharp tool and gouge and rough it up until you get a nice rough, rocky surface. I like to then use cheap superglue to strengthen any areas that might be weak. If you want to you can simply smother superglue over the entire base if you like. This makes it more likely to resist chipping and breaking. Make sure you make the bases before you put the model on it. Nothing worse than superglue in the details of a model, let me tell you now! So! You’ve done the base. It looks how you want it to, you’ve left the smooth areas for the lava floe and it looks about ready to go. BUT! The flat areas don’t look like lava yet. Here’s how I make the lava look sweet. First of all, you want to create some bubbles in the lava. We all know that lava has to be bubbling, it’s just a law of… stuff. It just doesn’t look cool unless you have some bubbles in it, trust me! So what I have been using is a combination of materials. To make big bubbles, I have found large round headed pins to be a great resource. Just get a pair of cutters and chop the ball in half, select the best looking bit and glue it down. For small bubbles I have been using Sago palm starch balls, glued down in the same fashion. Usually I just arrange them how I want and then surreptitiously drop a glob of superglue on top. That sets them in place. Secondly, smear the area with a thick helping of PVA or white glue. Don’t let it get onto the rocky areas except at the edges where the lava would touch. Let it go up the edges a bit so that it looks a little like the stone is melting. Make sure you also liberally cover the lava bubbles to smooth them into the whole picture. You may need to apply a few layers of the PVA to make this look effective, but keep going. Wait till it dries between layers so you know how much you need to do. Now you should have your bases looking right to go. Once they are dry, undercoat them however you like. I normally would use a flat black spray of some kind. One thing I should mention is, after the base is dry I personally attach the model too. That’s my preference mainly because of the way I work. You may be able to visualize the overall effect without having the two together, but I need them together to get the whole effect coherent. I haven't provided any photos of this up till now, because it's all pretty straightforward. 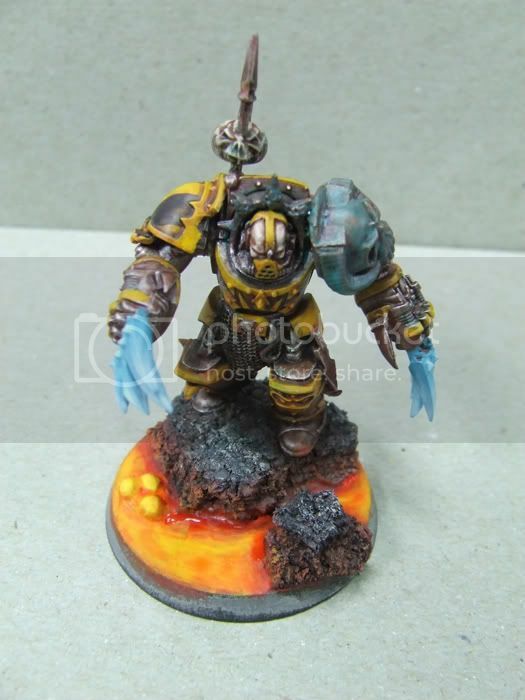 You can see from the first few pics of the models what the lava will start to look like once you have created the rocky ground and lava floe with it's bubbles. 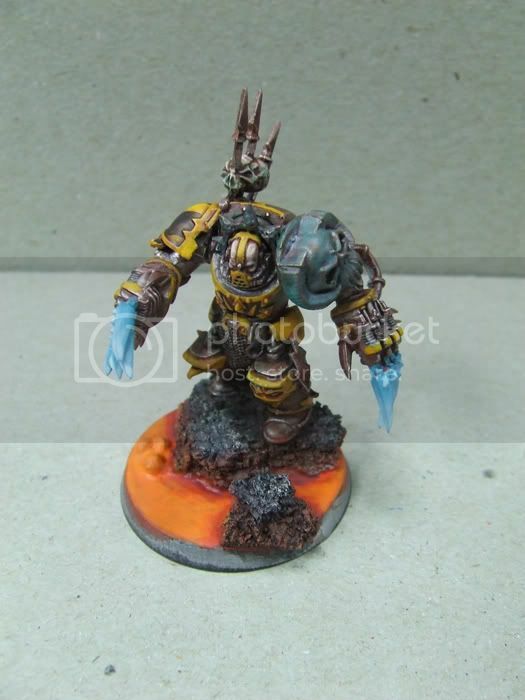 I didn't attempt to make crusty lava, my intention with the Iron Giants is to create a flowing liquid lava effect. Realistic? Who cares! Here’s where we get to the painting! 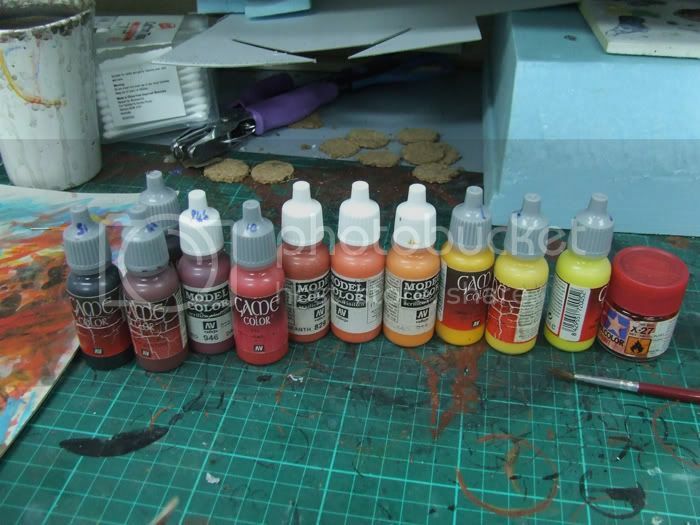 Here I will show you the pallet of colours and the list of bottles that are the paints I used. There are quite a few, and you will notice that there are quite a few colours. 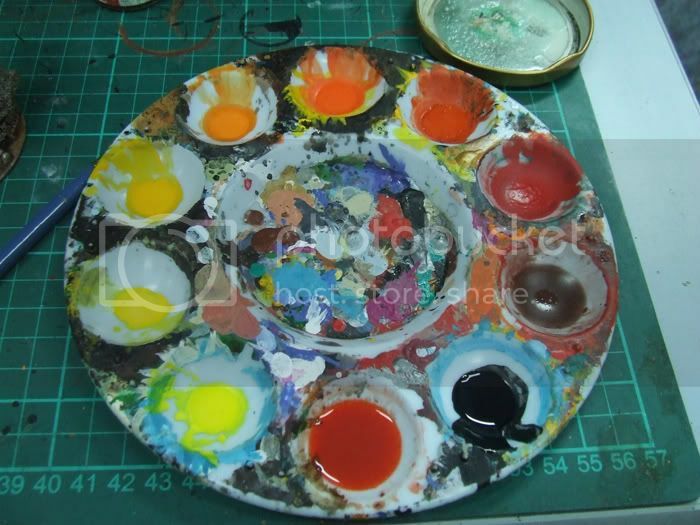 If you would prefer you can simply mix up or wet blend the paints as you go. I chose to use these colours, mainly because I was painting an entire army in this scheme and needed to keep it simple. My first step is to drybrush the rocky areas. This lets me tie it all in nicely later on. Starting with the black undercoat, I will drybrush with a dark blue grey colour which I usually mix out of a VGC Wolf Grey and Black. Then I’ll proceed to wolf grey, followed by Bleached Bone and maybe a tiny hint of white in the end. Then I undercoat the lava areas. I use a dark red-brown for the base of the lava, allowing some of the black to show through the paint. In the subsequent layers, you’ll see in the pictures that the layers are a bit streaky; this is to add to the flow effect of the lava. It helps give it the illusion of motion. After applying this I will then proceed to slowly build up the colours, transitioning through my palette from black through red to orange and finally the palest yellow I can find without adding white to it. For those of you wondering why I don’t use white; it’s because I find that it looks too cold as the highlight. Every time I’ve tried using it the appearance looks too pastel-like, so I avoid it. For the application of these colours, I gradually draw the brightness into the centre of where I envision the floe would be brightest, i.e. where it is deepest and most active. For the floe areas, I take it to the VGC Gold Yellow at the brightest point. For the bubbles, I highlight up to Bald Moon Yellow, which is my lightest yellow. At this point you might see that the paint is quite streaky and messy. That’s where I use a clear colour to tie it all together. My colour of choice here is Tamiya Clear Red. I mix it in with some water and a matt medium to take some of the shine away. The mix ends up about 1:5 red to water, with a drop of the medium. Then I apply it fairly thickly over the entire lava area. Now be very careful with the weather if you are doing this, if it’s raining or there is excessive humidity you might find that this mix with misbehave like a hyperactive child who has drunk too much red fizzy drink. Well, not that bad, but you might experience problems with the weather. We had some wet weather at the time I was painting these, and it played merry hell with my blending layers. As soon as the red has dried clear, you can then go back and retouch the highlights. This is the point where I will then go and add in the OSL (other source lighting) glow. I do this by drybrushing from a dark red through to red then to a warm orange. Maybe then, if I need to, I’ll add a small highlight of a lighter orange, but not too much. It’s hot lava not the surface of the sun! 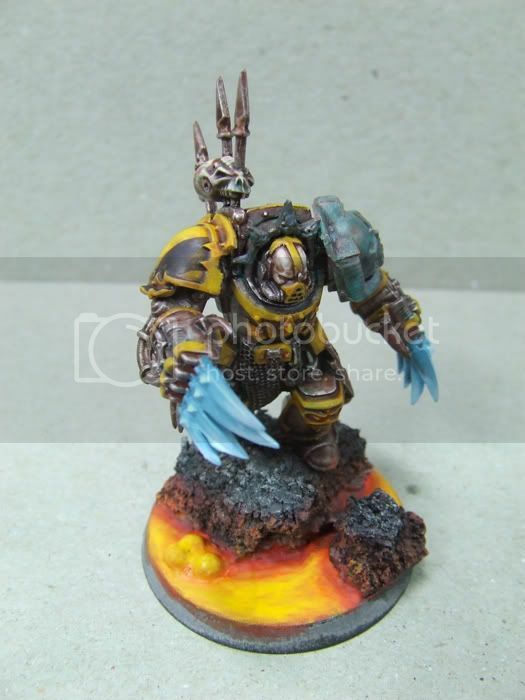 You can then tie the OSL effect together but glazing a dark red over the highlights, so that it draws the brightness down a touch and brightens the shadows up toward the red more. You might notice in the pics I did a lot of that as I went. It's up to you how you go, by the time I did the terminators I'd done the lava so much I did it all as I went pretty much. Either way doesn't make much difference, to be honest. So now if you’ve followed me through to this point you should have yourself a very convincing looking lava base. But you will probably notice that there is something missing. 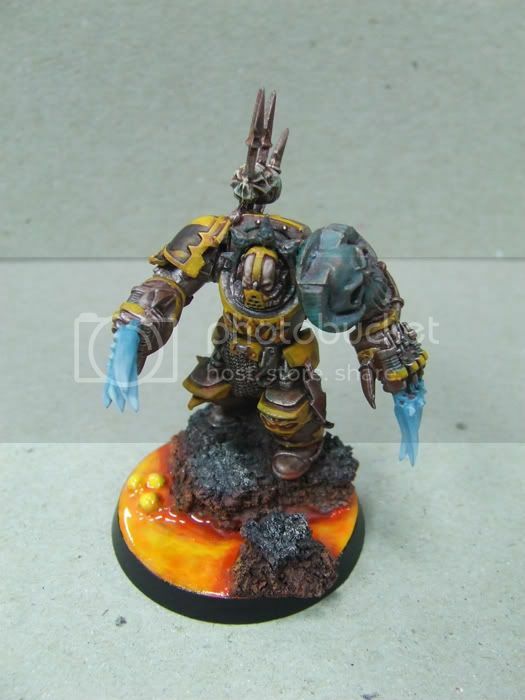 That’s right, I then use a clear gloss to brighten all of the lava areas up. Tamiya Clear is my choice paint, but you can use whatever you want to. I apply it quite thick, but not so that it runs over the edges and up the rocky areas. 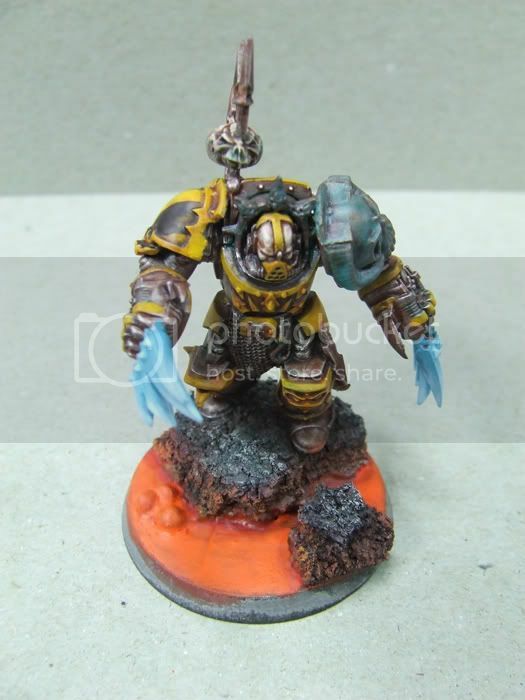 And I also do this both before AND after varnishing the overall model with a matte varnish. The reason is simple, when you add multiple layers of clear it gives the illusion of depth. 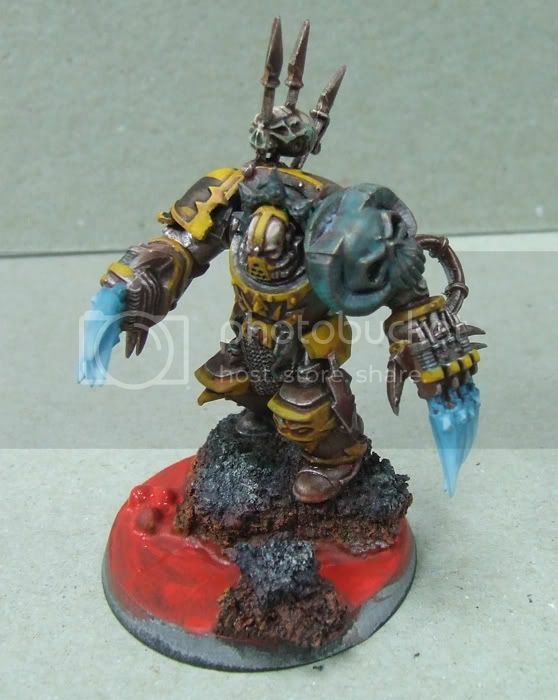 One thing I also did on the base of the Ripley Defiler was to add in layers of colour in between layers of clear. With Ripley I ended up about five levels of clear thick. It looks quite rich and it gives the lava an excellent illusion of liquid depth. My Iron Giants army does look quite effective with the entire force standing on the hot lava bases. One day I might make a display base for them to stand on and enhance the entire effect more. It won’t take that much work but, well, I’ve got to finish the army first so I know how many models are supposed to stand on it! 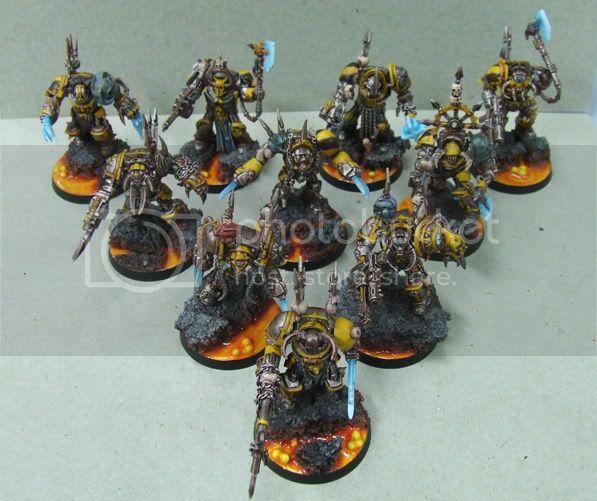 Here is the final pic of the finished terminators. I've since assembled and painted some more, but this is the number of terminators I did in one batch. 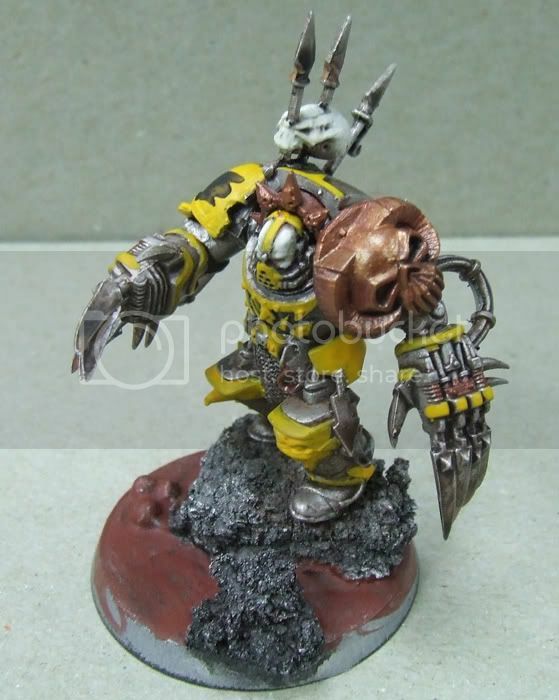 Well I hope you’ve enjoyed this article, and I hope that this will help you to reach new heights of miniature painting madness!